The main ingredient in this chocolate mousse is 125 grams / 4 oz chocolate with 70% cocoa content. I buy the most delicious dark Ecuadorian chocolate brand at Lidl at a ridiculous price (€ 1,75). Last Saturday I made this creamy delicacy for dessert. My guests loved it!!! Whisk egg whites until completely stiff, and double cream until fluffy. Set egg whites and cream aside. Break up the chocolate, melt in a glass bowl over hot water. Whisk the egg yolks and the whole egg, add eggs and Cointreau to chocolate and mix until smooth. 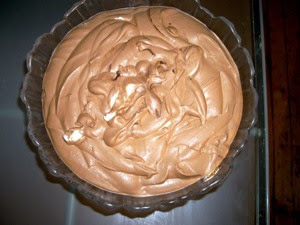 Fold cream into the chocolate and egg mix, and then the whisked egg whites gently into the mousse at the end. Pour into a glass bowl and cool down in you refrigerator for at least three hours. See other recipes on Enjoy Food & Travel here! !